A mysterious white spot can be seen in the newest images from NASA’s Dawn space telescope, which is rapidly approaching the dwarf planet. A strange, flickering white blotch found on the dwarf planet Ceres by a NASA spacecraft has scientists scratching their heads. The white spot on Ceres in a series of new photos taken on Jan. 13 by NASA’s Dawn spacecraft, which is rapidly approaching the round dwarf planet in the asteroid belt between the orbits of Mars and Jupiter. But when the initial photo release on Monday (Jan. 19), the Dawn scientists gave no indication of what the white dot might be. The inner Solar System, from the Sun to Jupiter. 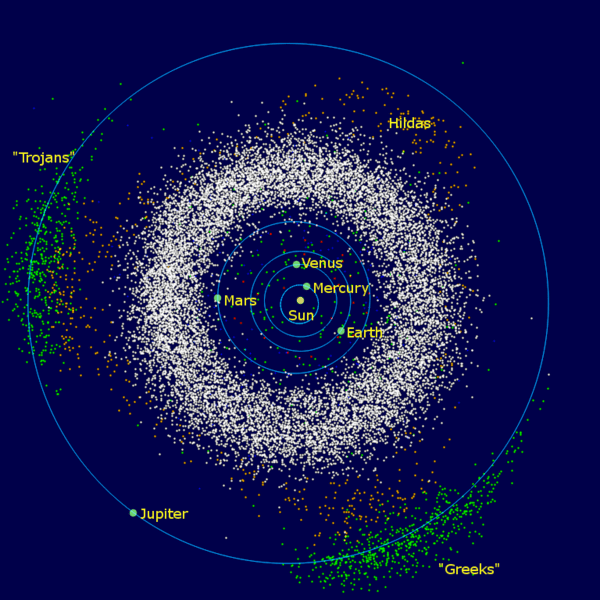 Also includes the asteroid belt (the white donut-shaped cloud), the Hildas (the orange “triangle” just inside the orbit of Jupiter), the Jupiter trojans (green), and the near-Earth asteroids. The group that leads Jupiter are called the “Greeks” and the trailing group are called the “Trojans” (Murray and Dermott, Solar System Dynamics, pg. 107). “Yes, we can confirm that it is something on Ceres that reflects more sunlight, but what that is remains a mystery,” Marc Rayman, mission director and chief engineer for the Dawn mission, told Space.com in an email. The new images show areas of light and dark on the face of Ceres, which indicate surface features like craters. But at the moment, none of the specific features can be resolved, including the white spot. Ceres is a unique object in our solar system. It is the largest object in the asteroid belt and is classified as an asteroid. It is simultaneously classified as a dwarf planet, and at 590 miles across (950 kilometers, or about the size of Texas), Ceres is the smallest known dwarf planet in the solar system. The $466 million Dawn spacecraft is set to enter into orbit around Ceres on March 6. Dawn left Earth in 2007 and in the summer of 2011, it made a year-long pit stop at the asteroid Vesta, the second largest object in the asteroid belt. While Vesta shared many properties with our solar system’s inner planets, scientists with the Dawn mission suspect that Ceres has more in common with the outer most planets. 25 percent of Ceres’ mass is thought to be composed of water, which would mean the space rock contains even more fresh water than Earth. Scientists have observed water vapor plumes erupting off the surface of Ceres, which may erupt from volcano-like ice geysers. The mysterious white spot captured by the Dawn probe is one more curious feature of this already intriguing object. NASA’s Jet Propulsion Laboratory, Pasadena, California, manages the Dawn mission for NASA’s Science Mission Directorate in Washington. Dawn is a project of the directorate’s Discovery Program, managed by NASA’s Marshall Space Flight Center in Huntsville, Alabama. The University of California at Los Angeles (UCLA) is responsible for overall Dawn mission science. Orbital Sciences Corp. in Dulles, Virginia, designed and built the spacecraft. UCLA is responsible for overall Dawn mission science. The Dawn framing cameras were developed and built under the leadership of the Max Planck Institute for Solar System Research, Gottingen, Germany, with significant contributions by German Aerospace Center (DLR), Institute of Planetary Research, Berlin, and in coordination with the Institute of Computer and Communication Network Engineering, Braunschweig. The Framing Camera project is funded by the Max Planck Society, DLR, and NASA/JPL. The Italian Space Agency and the Italian National Astrophysical Institute are international partners on the mission team.